My assignment from Get It Scrapped! : Make a page that has many of some element collected in a grouping. What a great opportunity to do a little stash busting! This page is about my Mom's love of cats, whether the cat in question wants to be loved or not. Hearts are an obvious theme for the layout and I collected them in two ways. First, vellum heart stickers (Studio Calico) are placed on top of patterned paper hexagons and layered on the page with raised adhesive. 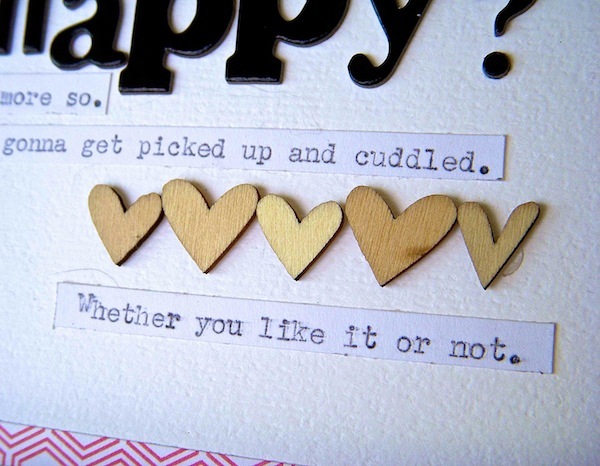 Next, a border of wood veneer hearts (more Studio Calico) appears between the journaling strips. These subtle embellishments add dimension and interest without overwhelming the page. I gotta tell ya, black cats are hard to photograph. I love Chessie's wide eyes in that picture. She does not like strangers, nor to be picked up. Which hardly matters to my Mom. To see what the rest of the Creative Team has collected on their layouts, check out the article here. Awesome page, Sue! Sad that the poor cat has to endure such abuse! 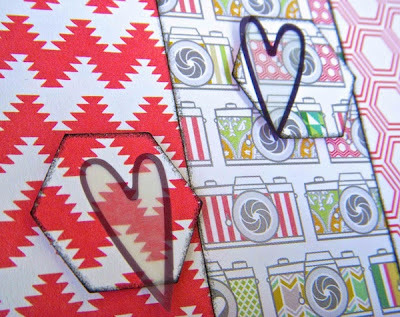 :) Love the combo of papers and the hearts on the hexagons. Great page! I love your choice of black letters for the title. And the subject made me chuckle. My mother's voice irritates our kitty so much, he hid from my Mother the entire week she was cat sitting. She thought he was lost and he was just hiding in the woods. Cat's definitely look after #1. I agree--black cats are hard to photograph indoors! It seems like they almost disappear in pictures, at least in mine...... Great layout!! No only are the grouping great - tight and loose - but I love your choices for the papers and the fonts. Fab page, Sue! Lovely stuff. I hope some of the bloggers who took part in my embellishment swap get a chance to catch up with this article! Love this Sue! I love your pp's! Hearts and hexagons. great idea and you made hexagons new again. 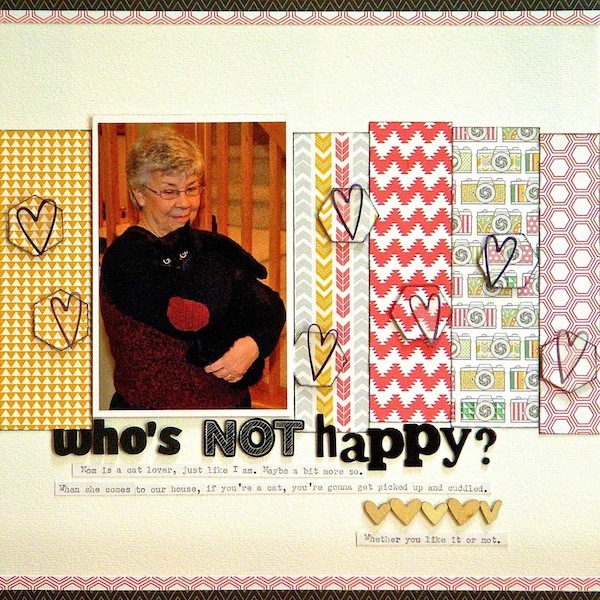 Hearts + hexagons + paper strips = one fabulous layout, Sue! Wow! First, i love cats! Second--hearts and hexagons look so cool. Love this idea!! Great use of "clear" accents - it looks awesome! And like all the other commenters, love the hexagons with the hearts! Amazing page Sue!! Love how you popped up those Hexagons and added the hearts...such a fun touch! I love the idea of the raised hexagons using the same papers! This is gorgeous! The page has such POP. Really neat how you achieved that effect. I can't get over the difference in expression between your mom and your cat. I love this story! so so sweet!! I LOVE the hearts!! That is so cute!! LOVE the use of pattern paper! That is just a darling page!! Pretty great page Sue! I love how you gave hexagons a new life with the layering of the hearts! Great idea!